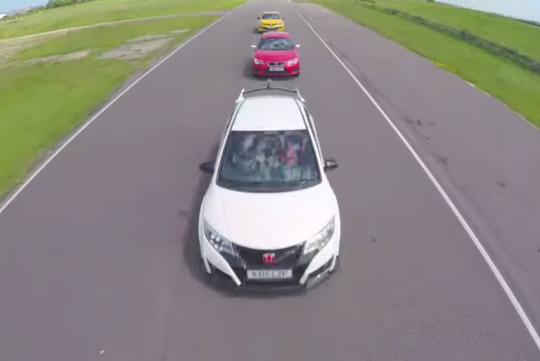 > Is the new Civic Type R the fastest around a track? Is the new Civic Type R the fastest around a track? Auto Express took the new Honda Civic Type R and threw it into a battle with the Seat Leon Cupra 280 and the Renault Megane RS Trophy. Can the 306bhp Civic Type R maintain its reputation as the fastest front-wheel drive hatchback on the famed Nurburgring and go round a smaller track at llandow, Wales, faster than the 276bhp Seat and the 271bhp Megane? Watch to find out! Would like to see the Golf R and M135 in there even if not FWD. Since they mentioned the Focus RS at the end, which is also not FWD. Auto Express already tested the new Civic against the BMW's 420bhp M3 and Audi's new 362bhp RS3. Golf R and M135 need not compete in the fight coz the answer quite clear leow but take that with a pinch of salt.